Welcoming, friendly, and fun. That’s what we think of Southwest Airlines, the airline that’s all heart. 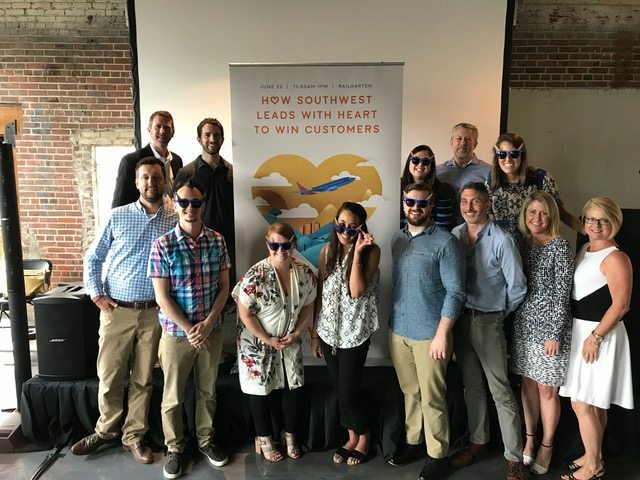 When inferno invited Jennifer Bridie, Senior Manager of Communications & Brand Identity at Southwest Airlines, to share her insights at the AAF Memphis June luncheon, she was totally on board. Jennifer piloted the audience through “How Southwest Leads with Their Hearts to Win Customers.” Amy Lyon, Vice President and Account Director from Southwest Airlines’ agency GSD&M, helped navigate by offering the agency’s perspective. inferno earned triple bonus miles by doing the creative work to promote the event. Senior Art Director Derrick Alston fastened his seat belt for a direct flight to his happy place – original illustration.